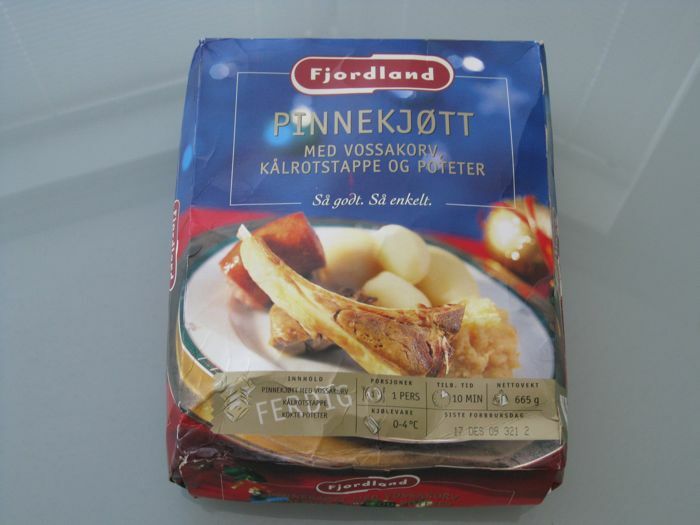 My good friend Jan who lives in Norway knows how much of a foodie I am, and for a while now, he had been raving to me about one of his favorite traditional Norwegian dishes called PinnekjÃ¸tt. Well, look what he sent me this week! 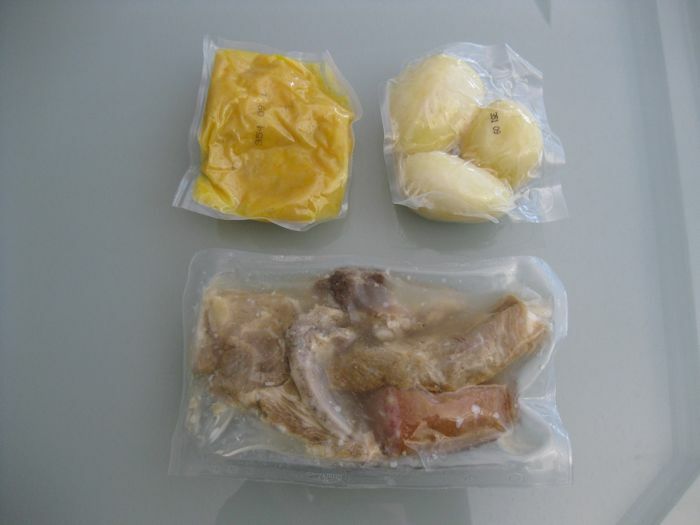 The main bag of meat contains lamb ribs and sausage. 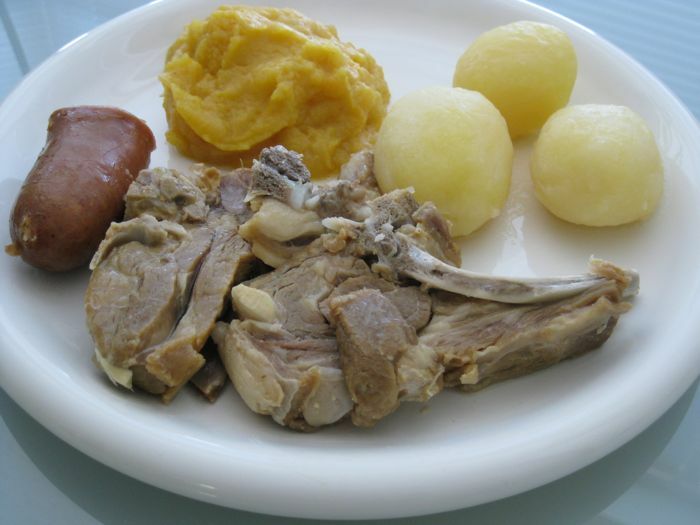 The sides are peeled boiled potatoes and a mashed Norwegian turnip called kÃ¥lrot. Cooking them up couldn’t be easier- you just drop the bags into boiling water for 10 minutes and it’s done. Then just cut open the bags, plate the goodies and it’s time to eat! There’s something very comforting about this kind of food. The lamb was so falling-apart tender, kind of like meat that you’d find in a bowl of a soup. It was very well seasoned and had that gaminess we associate with lamb but in a mellow, fragrant sort of way. Absolutely delicious. The sausage was reminiscent of kielbasa, with a deep smokiness and a nice firm texture. The potatoes were just potatoes, rather unremarkable on their own. But on Jan’s advice, I saved the cooking liquid from the bag of meat and used that as a sauce. The liquid was rather salty and had that aroma of lamb which really brought the potatoes to life. And to contrast the saltiness of the meat and potatoes, the mashed kÃ¥lrot was fantastically buttery and sweet, sort of like really good squash. What a meal! So I’d like to say thanks to my amigo Jan for a fantastic treat. Now I understand why so many Norwegians choose to have PinnekjÃ¸tt as their Christmas dinner. But with something so delicious, what I don’t understand is why they don’t have it all year round! BjÃ¸rn, I do hope to make it out to Norway someday to try it there. Your mom’s cooking sounds legendary!